Many pond species will thrive in a tabletop water garden. Some float, others grow in moist soil. Treat most water garden plants as annuals. 1. Water Lettuce: (Pistia Stratiotes) They have great floating rosettes of leaves and exquisite feathery roots. them to be able to hold water, sufficiently. 2. 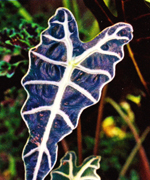 Elephant's ear: (Alocasia sanderiana) Moisture loving with dark green arrow shaped leaves. Each leaf has lovely silver veins that really add contrast to your arrangement. plug the hole with calk. It will fall out, eventually. 3. 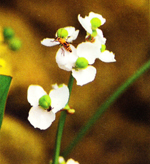 Arrowhead: (Sagittaria Latifolia) Dainty leaves that are arrow shaped and a lovely white blooms. In nature this plant grows at a ponds edges. Tip: High-fired pottery, Poly Resin, Cement, Metal, Fiberglass etc are preferable styles. Terracotta clay is meant to break down over time and is not the best product to use for a water feature. 4. 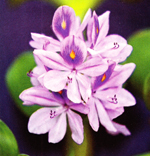 Water Hyacinth: (Eichhornia crassipes) A pale blue to violet flower that clusters above floating leaft rosettes. Stunning! 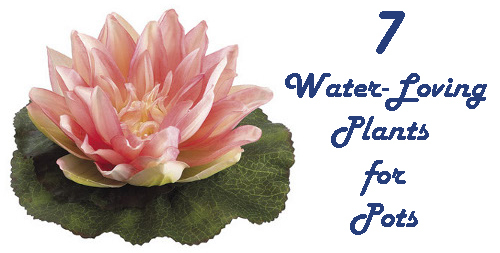 Tip: Many types of water plants are colorful and bright. You don't necessarily need a colorful piece of pottery to start with. The black clay Vietnamese pottery we use is "high fired" and will wear just as good as ceramic. 5. Caladium: (Caladium bicolor) Grown for its showy green leaves that are spotted with white, pink or red. Many varieties. Tip: A nice mixture of grasses, plants and flowers make the most interesting containers. Just use materials that you like and you can't go wrong. 6. 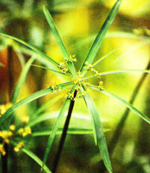 Umbrella grass: (Cyperus involucratus) This clumping grasslike annual forms umbrella like inflorescences on top. Water pots are not the easiest set ups to create. But, as you can see from the photos below they are some of the most beautiful. Take the time, do your research, talk to your local plant specialist and have fun. 7. Waterlily: (Nymphaea Spp) Iconic floating water garden plants. Both tropical and hardy varieties are available. Ask your local garden or nursery center.